My friend, Lisa, is ahead of the shoe trend game writing about her Adidas Superstars a few months ago. Celebrities have obviously taken note, ha! If you google image search “celebrities in Adidas Superstars“, you will find hundreds of photos of different celebrities, men and women alike, wearing Adidas Superstar sneakers. Shown above is Kylie Jenner and Gigi Hadid wearing Adidas Original Superstar sneakers in classic white with black stripes (which appears to be the most popular color combination). Other celebrities spotted wearing Adidas Superstars include Dakota Fanning, Emma Roberts, Emma Stone, Kristen Stewart, Rita Ora, Kourtney Kashdashian and Justin Timberlake. These retro-inspired Adidas Superstar Fashion sneakers are available from Amazon in array of color combinations for men, women and children. Great, now I want a new pair of Adidas Superstars, too! 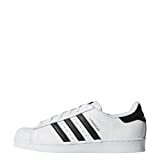 You can find Adidas Superstar Sneakers for the best price on Amazon.